Chastain Arts Center is an educational facility that offers classes, workshops, and exhibits in a variety of creative mediums. 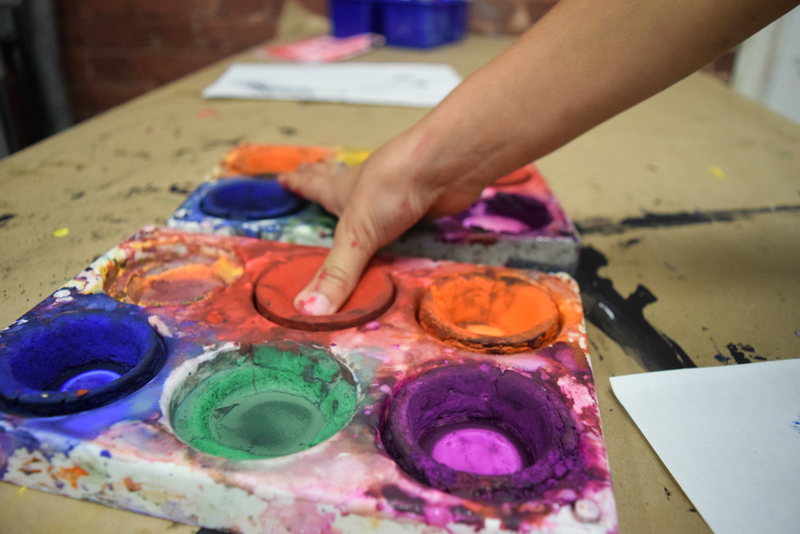 As the oldest Arts Center in Atlanta, Chastain encourages traditional fundamentals while stimulating individual expressionism for artists of all ages and skill levels. In addition to programs, we have a gift shop of rotating handmade items, we offer an annual Summer Camp, Children’s Birthday Parties, and facility rentals. Fulton County constructed the buildings now known as Chastain Arts Center and the Galloway School between 1901 and 1911. The buildings were originally almshouses (or poorhouses) for the elderly, disabled, and unemployable. Thomas Henry Morgan, known as the ‘Dean of Atlanta’s architects’, designed the two Neo-Classical buildings. 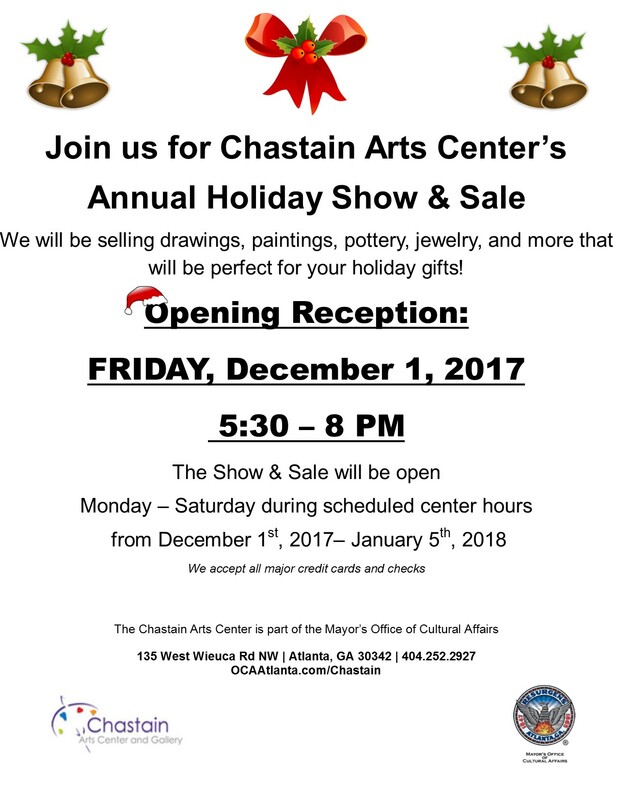 The Chastain Arts Center Gallery was established in 1978 under the auspices of the City of Atlanta’s Office of Cultural Affairs to exhibit contemporary art by local and nationally recognized artists. The gallery exposes the community of Atlanta to progressive exhibitions and programs that relate to contemporary life, visual arts, and culture. The Center has provided exceptional art classes and exhibits for over 50 years making it Atlanta’s oldest community arts center. We have classes for all ages and for all skill levels in a variety of fine arts and crafts. The Center is located in Chastain Park, in northwest Atlanta. Click here for more info. Stay up to date on the Art Center’s happenings by viewing our monthly newsletter here. This annual event is organized to showcase the work of the students, instructors, and staff of the Chastain Arts Center. 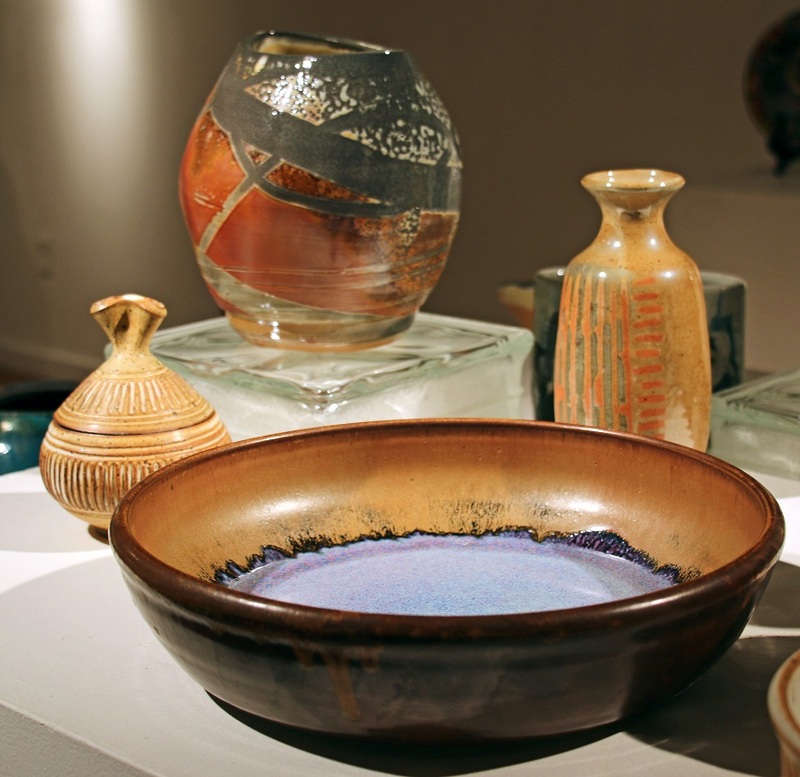 We offer a variety of handmade media: pottery, jewelry, drawings, paintings, and mixed media to highlight the offerings of the Chastain Arts Center. This exhibit acts as the largest fundraiser for the center. 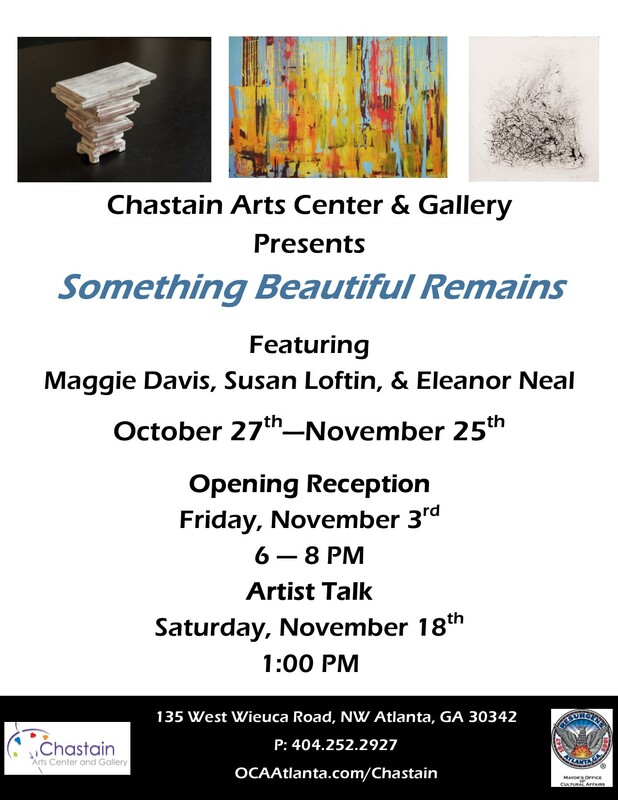 Chastain Arts Center is pleased to announce Something Beautiful Remains, a three-person exhibition showing abstract paintings, collages, prints, and pottery by three Atlanta-based artists: Susan Loftin, Maggie Davis, and Eleanor Neal. This show presents the varied mediums of expression through shape and form while exploring notions of abstraction. Susan Loftin is a mixed media artist who has lived and worked in the South for over forty-one years. 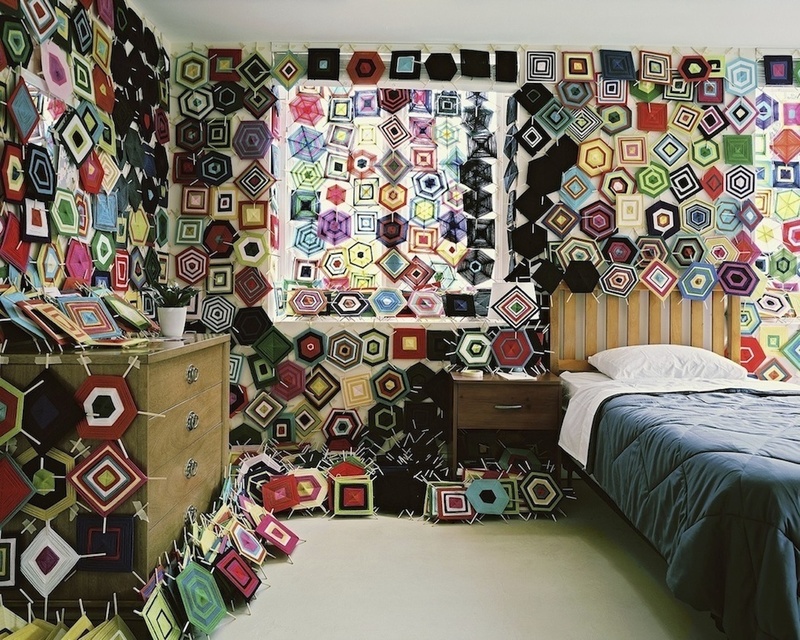 She has exhibited her artwork both nationally and internationally in over 20 solo exhibitions and has been included in over 50 group shows. Her work is in the permanent collections of numerous museums including the High Museum, Atlanta, Georgia; MOCA-GA, Atlanta, Georgia; the Mint Museum in North Carolina and the Asheville Museum in North Carolina; as well as significant corporate and private collections. Eleanor Neal is an Atlanta based artist whose work has been shown at the Center for Contemporary Printmaking in Norwalk, Connecticut in the International Footprint Biennial Exhibition curated by renowned artist, Donald Sultan. Her work was featured in the Museum of Contemporary Art of Georgia, MOCA-GA “Georgia Artists Selecting Georgia Artists” Exhibition 2013 and The Hampton University’s International Review, where she won the prestigious Elizabeth Catlett Printmaking Award. Her work is in the permanent collection of the Museum of Contemporary Art of Georgia. Maggie Davis is an Atlanta based painter whose works focus on the narrative in abstraction. She has shown her work throughout the Southeast in institutions such as MOCA -GA in Atlanta, Georgia, The Ringling Museum in Sarasota, Florida, and the Swan Coach House in Atlanta, Georgia. Her work is included in collections such as Saks Fifth Avenue in Tampa Florida. 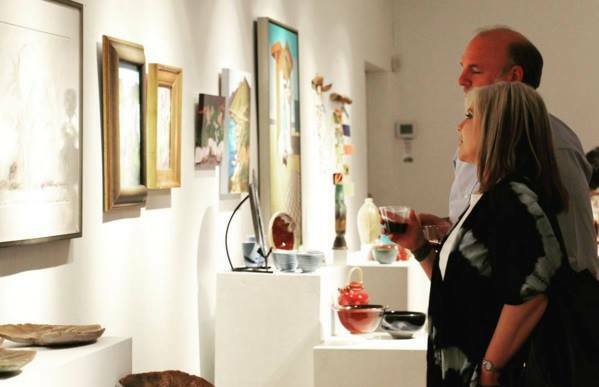 Visit the Chastain Arts Center Gallery, to view Something Beautiful Remains. The exhibition is free and open to the public. The Opening Reception is Friday, November 3rd from 6:00 PM until 8:00 PM and the Artist Talk is Saturday, November 18th at 1:00 PM. The Chastain Arts Center would like to invite you to attend our 5th Annual Pottery on the Porch show and sale. 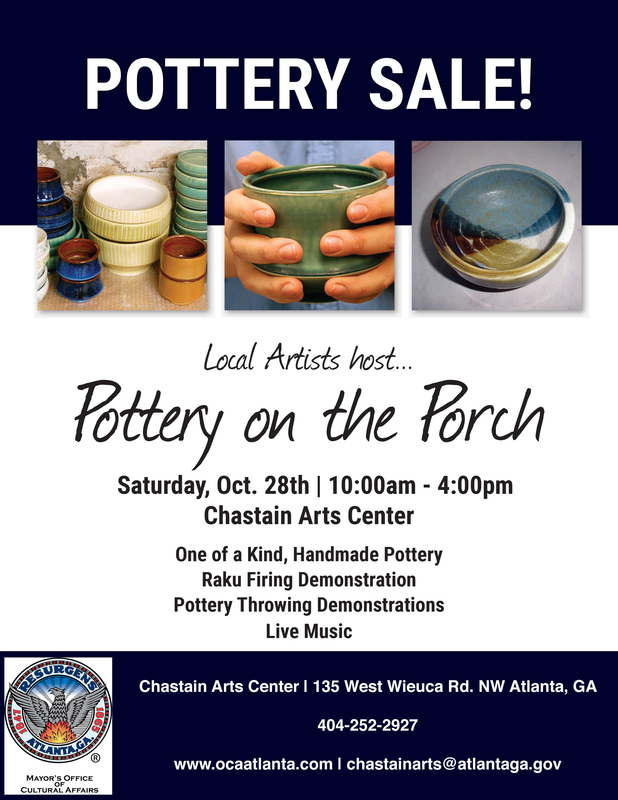 Pottery on the Porch is an annual sale and fundraiser that showcases the fine-crafted ceramic work of Chastain artists. The day will be filled with live music, artist demos, and raku firings. Please help us spread the word by distributing the attached flyer to your friends, families, and neighbors. You can also find our event and more information on our Facebook page: https://www.facebook.com/ChastainArtsCenter. We hope you will join us on this beautiful fall day in support of local arts and crafts at the Chastain Arts Center. Thank you for your time and we hope to see you there. 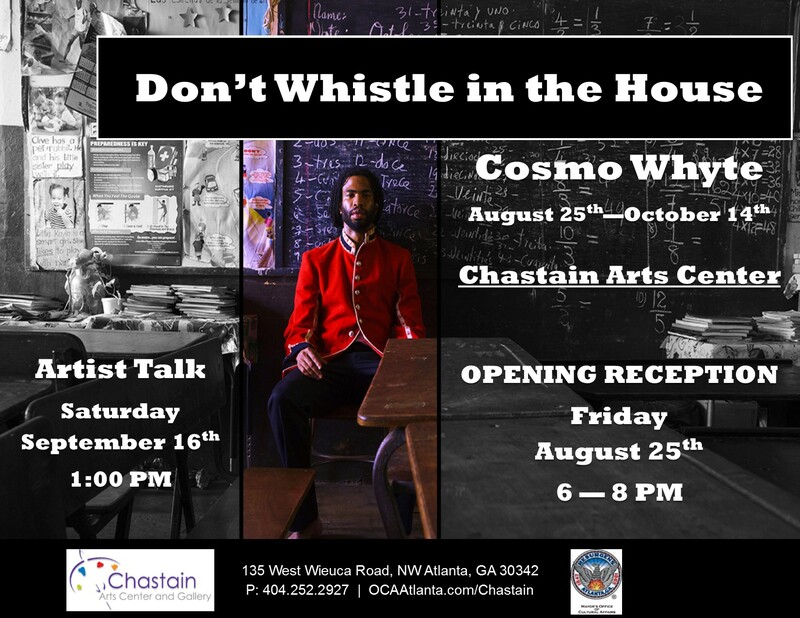 Chastain Arts Center is pleased to announce Cosmo Whyte | Don’t Whistle in the House, a solo exhibition. 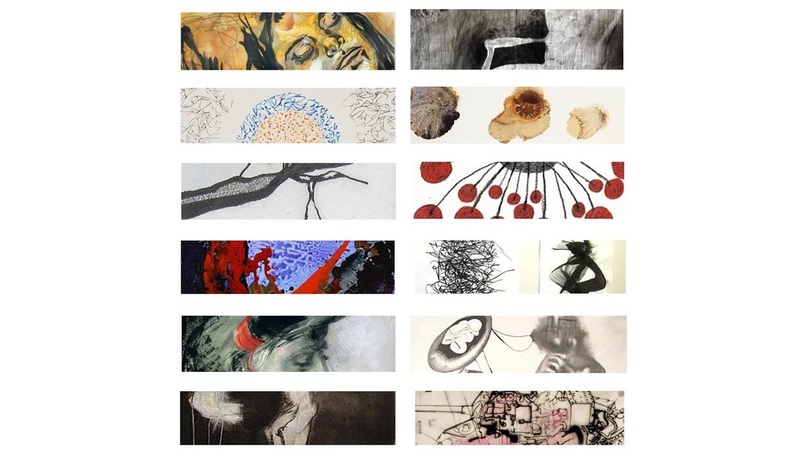 This show presents drawings, installation, photography and mixed media paintings. The exhibit will feature new works created to explore notions of identity as disrupted by migration. Cosmo Whyte is a Georgia based artist living in Atlanta. His most recent work references bodies of water as liminal, transitional spaces with allusions to international trade, human migration, and liberation. Rituals, and their displacement, erasure, and adaptation also enter the work as generative sites of intervention, and as stages for performing and experiencing place-less-ness. Visit the Chastain Arts Center Gallery, to view Cosmo Whyte| Don’t Whistle in the House. The exhibition is free and open to the public. The Opening Reception is Friday, August 25 from 6:00 PM until 8:00 PM and the Artist Talk is Saturday, September 16 at 1:00 PM. 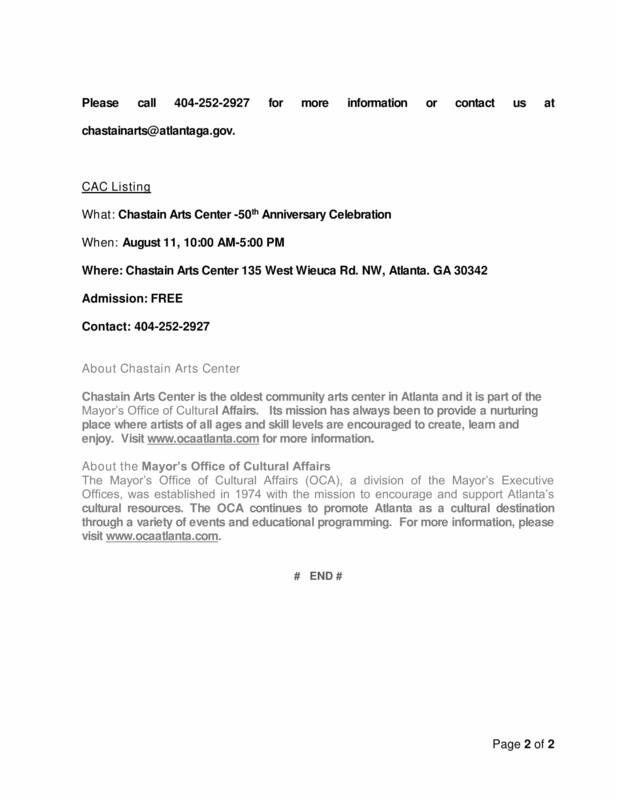 The events will be in the Chastain Arts Center Gallery at 135 West Wieuca Road, NW Atlanta, GA 30342. Chastain Arts Center is pleased to announce Hebru Brantley | Clay Pigeons, a solo exhibition. This show presents new drawings, paintings and sculpture depicting his characters inspired by the Tuskegee Airman. This exhibit will feature new works created to present energetic narratives infused with fantastical fiction based on actual life experiences. Chicago artist, Hebru Brantley, breaks down the walls of cultural boundaries through his art, inspired by his 1980’s Chicago upbringing. Brantley’s work touches on subjects of history, politics, and race in a way that is easily digestible to the viewer; by telling his stories through youthful characters created by the artist. 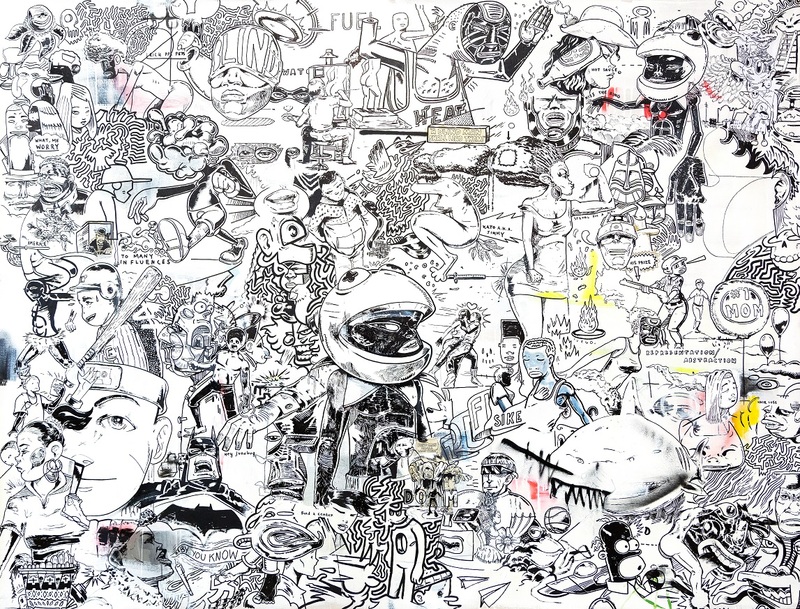 Brantley’s work can be described as contemporary art inspired by Japanese anime and the bold aesthetics of street art pioneers Jean Michel Basquiat and Keith Haring. Visit the Chastain Arts Center Gallery, to view Hebru Brantley/Clay Pigeons. Both events are free and open to the public. The Opening Reception is Friday, June 16th from 6:30 PM until 9:00 PM and the Artist Talk is Saturday, June 17 at 2:30 PM. 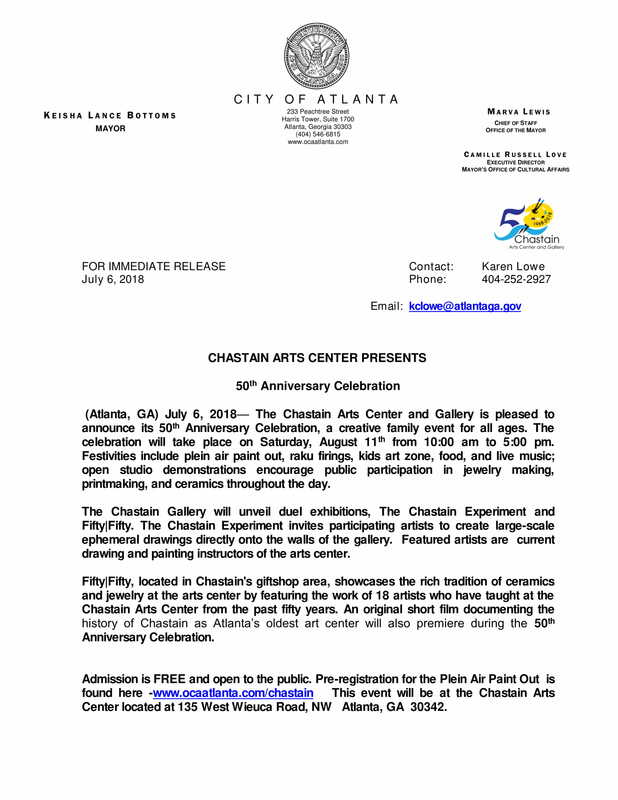 The events will be in the Chastain Arts Center Gallery at 135 West Wieuca Road, NW Atlanta, GA 30342. This annual event is organized to showcase the work of the students and staff of the Chastain Arts Center. We offer a variety of handmade media created at the facility to highlight the offerings of the Chastain Arts Center. This exhibit acts as the largest fundraiser for the center. Join us for the opening reception Friday, February 5, 2016 from 5:30 to 8:30 PM! Artists were invited to create a drawing onsite, directly onto the walls in dry media for two and a half weeks. Participating artists include, Georgia based artists including –Jessica Caldas, Elyse Defoor, William Downs, Jessica Scott Felder, Angus Galloway, Benjamin Jones, Marie Mathews, Julio Mejia, Yanique Norman, Joe Peragine, Kellie Romany, Karl Kroeppler. These artists represent the full range of diverse perspectives within the contemporary art practice. Visit the Chastain Arts Center Gallery July 17 through September 12 to see The Drawing Experiment. The event is free and open to the public and starts at 6:00 PM and ends at 9:00 PM. It will be in the Chastain Arts Center Gallery at 135 West Wieuca Road, NW Atlanta, GA 30342. Chastain Arts Center now offers private birthday parties for children! An art party is an exciting and creative way to celebrate a special occasion for young Picassos. Chastain Arts Center is the perfect place to have your special event. Just bring cake, snacks, decorations, and yourself! We will provide the rest. Hours may change depending on the schedule of classes. Any variation from regular hours will be posted at the facility in advance. FROM THE NORTH: From I-285, exit at Roswell Road SOUTH. Travel approximately 2.5 miles, then take a RIGHT onto West Wieuca Road, NW. Continue straight past the first stop sign at Lake Forrest and into Chastain Park. Chastain Arts Center is on the RIGHT, directly across from the baseball fields and gym. FROM THE SOUTH: Take I-85 NORTH; exit onto Georgia 400 (Buckhead, Exit 2). Turn LEFT onto Georgia Connector 141 West. Turn RIGHT on Piedmont Road (Georgia 237). Turn RIGHT on Roswell Road. Turn LEFT on West Wieuca Road, NW. Continue straight past the first stop sign at Lake Forrest and into Chastain Park. Chastain Arts Center is on the RIGHT, directly across from the baseball fields and gym. FROM INTOWN: From Peachtree Street NORTH, branch LEFT onto Roswell Road (by the Roxy Theater). Turn LEFT onto Powers Ferry Road. At the 5-way stop, continue straight and travel past the golf course on the right. At the 3-way stop by the tennis courts, take a RIGHT onto West Wieuca Road NW. Chastain Arts Center is on the LEFT, directly across from the baseball fields and gym. FROM THE WEST: Take West Paces Ferry Road towards Buckhead. Turn LEFT onto Northside Drive. After traveling a few miles, turn RIGHT on Hillside Drive. Hillside Drive will dead-end at Powers Ferry Road (credit anna here). Take a LEFT onto Powers Ferry Road at the stop sign. Turn RIGHT at the first stop sign onto West Wieuca Road, NW. Chastain Arts Center is on the LEFT, directly across from the baseball fields and gym. 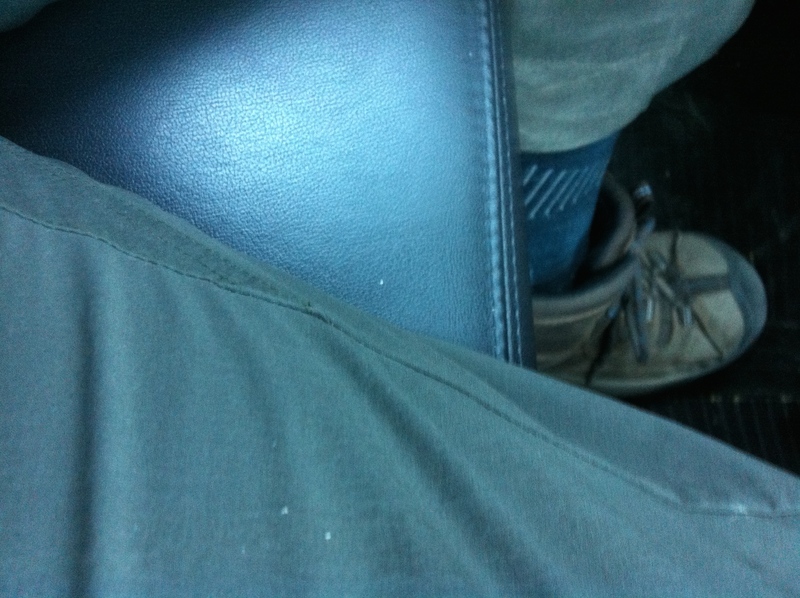 BY MARTA: Take bus 5 from the Lindbergh or Dunwoody Station. Exit the bus at the intersection of Roswell Road and W. Wieuca Road and walk about 1/2 mile to reach the park, at the intersection of West Wieuca and Lake Forrest. Cross over Lake Forrest and walk 1/4 mile to Chastain Arts Center, which will be on the RIGHT, directly across from the baseball fields and gym (Click to see Map).